The Mount Washington Valley Ski Touring & Snowshoe Foundation has roots in the Valley for over 25 years. A group of interested community leaders established a network of cross country (XC) ski trails linking points of scenic beauty, ski related services and lodging. An integrated use and management policy was established with other nonprofit ski foundations, schools, ski teams and clubs and other organizations in the Valley. The Board of Directors includes representatives from the Town of Conway, Conway School District, Eastern Slope Ski Club (a 501 (c) (3) organization) and charitable minded prominent members of the Mount Washington Valley. Free XC skiing anywhere in the entire 60k network for all elementary, junior & senior high students of SAU#9 and SAU #13 (over 2900 students). Included are all the towns in northern Carroll County - Jackson, Bartlett, Conway, Tamworth, Madison, Freedom and Albany. Free skiing anywhere in the entire 60k network for all Conway residents and non-resident taxpayers. Over 2000 Conway residents or taxpayers participate. Free grooming in Conway's Town Forest (Whitaker Woods) for use by the Eastern Slope Ski Club's after-school-ski-program, the North Country's largest school ski program, and for use by three of the area's largest elementary schools’ three times per week cross country ski classes and season's end Ski Day event for all Valley students. 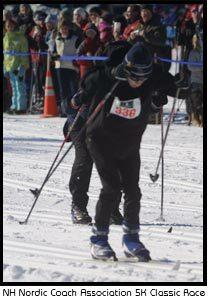 Free grooming for Kennett High School XC Ski Team’s training and interschool races, including: NH State XC Finals Championships, regional meets and Bill Koch League races. No race fees are charged, regardless of residency. Free XC skiing for all area Special Olympic XC team members, coaches and staff. Free trail use for all fundraising XC events for such nonprofits as Children & Youth Project and Arts Jubilee. Free educational clinics and classes each season including Boy Scout and youth group tours. Free equipment is offered at many of these events.